Dr. James Upshaw is a native of Atlanta, Georgia. He graduated from Riverwood High School in 1982. After attending Emory University, he transferred to Southern Methodist University in Dallas, TX, where he earned a Bachelor of Arts Degree in both Biology and French. In 1993, he received his M.D. degree from the Medical College of Georgia in Augusta. Dr. Upshaw completed his training in Internal Medicine at Barnes Hospital, Washington University Medical Center in St. Louis, MO. 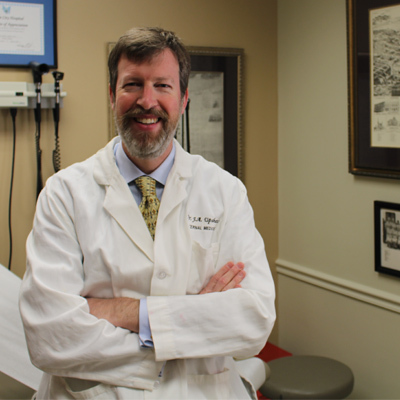 Following the completion of his residency in 1996, Dr. Upshaw moved to Macon and joined Internal Medicine Associates, P.C. He was Board Certified in Internal Medicine in 1997. In addition to his private practice of general Internal Medicine, he is affiliated with the Mercer University School of Medicine as a Clinical Assistant Professor and faculty preceptor. He is also active as a clinical preceptor for the Georgia College and State University, Walden University, and Georgia Southwestern State University schools of Nursing. He served as a visiting professor at the Kurobe City Hospital in Japan in 2004 and 2014. Dr. Upshaw was named a Fellow with the American College of Physicians in 2006. Dr. Upshaw is a member of the Bibb County Medical Society and has staff privileges at both the Navicent Health Medical Center of Central Georgia and Coliseum Medical Center. Prior to attending medical school, Dr. Upshaw worked in the tourist industry, leading bicycle tours in France. He completed a rotation in Montpellier, France during medical school, then also in Paris during his residency. To share his love of the French language and culture, Dr. Upshaw volunteered to teach French to his son’s class at Stratford Academy from 2006 until 2012. He and his wife, Amanda, and son, Charles, reside in historic Shirley Hills in their restored 1923 home. In his spare time, he enjoys attending his son’s sporting events and traveling with his family. Dr. Upshaw is active in the Macon Civic Club and sings in the choir at Vineville United Methodist Church. He has served on the boards of Macon Heritage Foundation, the Macon Symphony Orchestra, and the Kappa Alpha Order Alumni Association.